A few years ago I offered a challenge to work colleagues to come up with a well-known game that I would try to reproduce in PowerPoint. "Of course," I said "keep it reasonable and don't ask me to do something like Monopoly". At that time I couldn't have made Monopoly on PowerPoint. Having learned and developed some new techniques since then, making a Monopoly game has become possible. 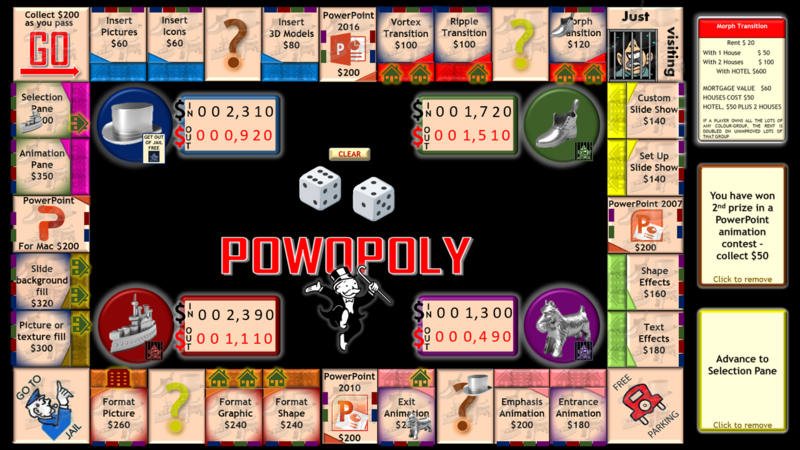 Re-named 'Powopoly', it's a game for up to four players and uses PowerPoint functions and features rather than street names, and PowerPoint Versions instead of Railway Stations and Utilities. There are still quite a few traditional Monopoly elements though. All I need to do now is add some instructions and the rules, and it's ready to make public. Some aspects of the original game have been simplified such as only needing to have two houses before you can buy an hotel, but generally the game-play holds pretty well to the traditional game. Interesting to see how you have pulled this off without VBA. I also agree with Tim to really make it more of a parody of PowerPoint. Nice suggestions btw, Tim! Thanks for the feedback guys. Sorry about the cringe factor for you Tim! 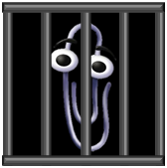 I've started work on the great idea about Clippy. You'll be glad to see he's now securely behind bars where he deserves to be! I also like the parody idea and the suggested Chance cards, but....I want the Chance cards to keep within the principles of the original Monopoly game and relate to 'realistic' reasons for paying out or collecting money. (E.g. I don't think Microsoft listening to my UserVoice feedback will directly result in my receiving $100 - or will it?). So...I'll try to make some cards that meet both criteria and if you have any suggestions along these lines I'd really like to hear them. I've concentrated so far on getting the game-play to match the original as much as possible and when I added a slide with the original rules (which I've adapted slightly) realised that I didn't have anything for mortgaged properties, so I've had to do some more work on that. I'll post a link to the PPTX file when I can. Btw- have you had a chance to look at the new Horyd House game yet? Here's a link to Powopoly - adjustments above not yet made apart from 'Mortgage buttons' which have since been added. As you'll see, apart from a few simplifications, it's more-or-less a full Monopoly game and can be played to virtually all the original Monopoly rules. As usual, download first from PowerPoint Online (which has changed recently) there's a new 'Open in PowerPoint' button.